The line “What could possibly go wrong?” is arguably more famous than the Bubsy series itself. While the original Bubsy, Claws Encounters of the Furred Kind, gained a cult following, the later entries were rushed to market and greatly lacked in quality. This all cumulated in Bubsy 3D, a PlayStation release that at the time pioneered some techniques, but was scored quite flatly on launch, and then slammed in retrospective reviews. Related reading: It's hard to go past DuckTales as an excellent example of a retro platformer remade. 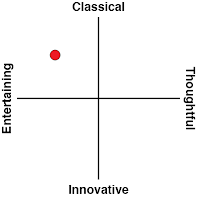 Matt's review. Eidetic, the developer of Bubsy 3D, went on to develop the Syphon Filter series and no one dared make a Bubsy game after the release of the title. For twenty-one years the series remained dormant until Hong Kong company, Billionsoft, resurrected the Accolade brand with a new entry in the Bubsy series - this time developed by Black Forest Games. 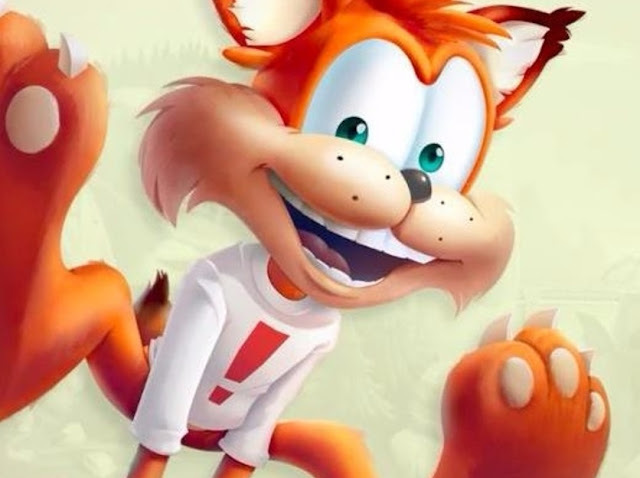 With the developers’ pedigree in rebooting The Great Giana Sisters many of us dared to hope that finally Bubsy would be back and finally take his place among the greats. Wishful thinking, as it turns out. Those looking for a good Bubsy title can stick to the original, because this one barely scrapes past the heritage of Bubsy 3D. While not a disaster of a game, it certainly isn’t something to write home about, and the publisher picked the worst time imaginable to release it - this game is actually vying against a Mario title for attention. Not just any Mario game. Mario Odyssey. And a Sonic game, too. 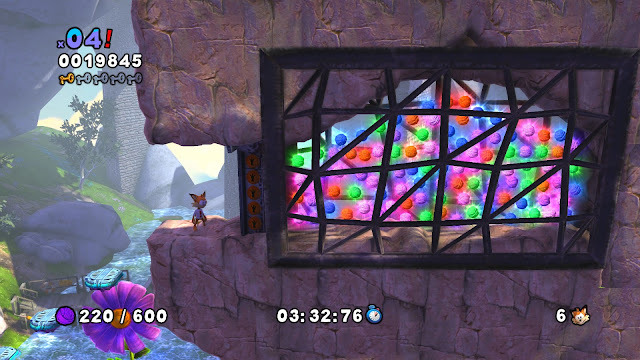 Bubsy: The Woolies Strike Back was always going to struggle as a platformer in this context. In a month full of prominent releases, Bubsy: The Woolies Strike Back falls short of capturing attention, but even if it had a clear run the game would still be a bottom of the pile, as it rides entirely on nostalgia for something that, simply put, many people aren't going to care about. If the game released on mobile platforms some of the technical aspects of the game could be forgiven, and it might have even got away with how painfully average it was in other ways, because mobile gaming is really in the doldrums at the moment. But it doesn't even have that. This is a console game. The story is straight out of the pages of the past entries, with the game once again pitting Bubsy against the Woolies. These aliens have stolen the golden woollen fleece from Bubsy, which in classical platform speak means "time to do a lot of levels from all over the world". 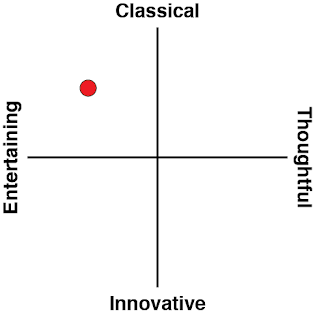 It does its thing and meets the criteria for showing us who Bubsy is and what his game is about, and that's all it does. He's a loud mouth, back chatting, anthropomorphic bobcat that collects wool while attempting to defeat the Woolies. As per the self-referential tone of the series, Bubsy, amusingly enough, recognises his own failings in his rants, but still, that's hardly enough to make you kick back and say that this game is in some way clever or insightful. Because it's not. The original Bubsy captivated me because of the way the world presented itself. 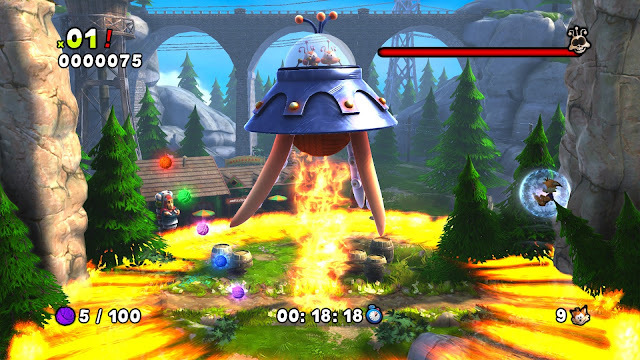 It was a more "clean" kind of platformer than its peers at the time, and while that meant simple level design at times, the environments themselves were packaged with foreground objects which could be scaled. For example, houses in the foreground in the opening level of the original that both look good, and function as a secondary level for platforming in that section. That was pretty mind-blowing for its time. Bubsy: The Woolies Strike Back however doesn’t captivate the player in the same way with its level design. Level design in general is the biggest issue of this Bubsy release. The playable area is limited and feels claustrophobic as a result. To an extent this is reflective of earlier Bubsy titles, but good platformers - even those playing with nostalgia - still adopt modern design principles around level design in order to keep players interesting. The backgrounds are gorgeous detailed art which places Bubsy in a location in his universe, but pretty levels are doesn’t excuse how formulaic structurally derivative they are. The levels can be played through by predominantly traveling with no deviation to your path, and that young me that loved the layering feel of Bubsy levels was left feeling very unawed in this game. That's always the risk when tapping into nostalgia - you need to give people the game they remembered, but do so in a modern way that they don't also remember the bad bits from games of that era. It isn’t just the structure of the levels which made me mellow on this game instantly. The antagonistic Woolies are practically everywhere on the map. What this weird nit-picking means is that the enemies find themselves scattered to achieve the illusion of difficulty. It is their pacing and location that are a nuisance, rather than any particularly interesting design in how the operate. This is how platformers back from the day worked, of course, but modern design is about challenging players by giving them enemies that have quirky design, not levels that are hard until they have been memorised. The latter is rote learning, and it's just not fun. Boss battles are also learned through rote memorisation, rather than meaningful design. 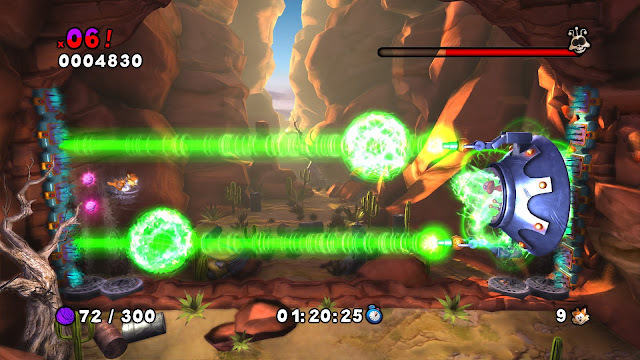 They're hard; I found myself having difficulty with the bosses, which resulted in playing the boss levels quite a lot. But then they become overly predictable and ridiculously easy. Good modern design would suggest that games need bosses that can organically challenge players by doing things that are simultaneously predictable, but manageable with enough skill. Or at the very least have attack patterns that are interesting. Bubsy's bosses are an uninspired lot. Related reading: Wonder Boy is another excellent example of nostalgia done well. Brad's review. Another technical disappointment comes from the occasional clipping issues or just plan weird level design. During my playthrough I found myself becoming a rock and had no choice but to restart the level. I also had the occasional time which I would either die by something I would assume I wouldn’t have hit or sometimes the other way around. Though clipping, hitbox, and other basic technical issues didn’t happen that often, what I instead found myself really raging at the way the game refused to teach its mechanics through level design, and instead dumped tutorials on players at the last moment. For example, the very first level has, at the end of it, a river which a giant rock that falls down from the ceiling. Of course this caused me many deaths until I released the timing which was required when pouncing into the breakable rock to roll onto the ground beyond it. A well designed platformer would have introduced this in a very safe way previously. In fact, the game has countless examples of offering simplistic, straightforward platforming that barely uses skills Bubsy has until right at the end, where there's a difficult, obtuse barrier. You can only assume the developers figured they'd get away with it all if players found that last barrier to the exit so difficult they forget everything that came before it. Bubsy's return to gaming after such a long time could have been used to reboot the franchise, but I can't see that happening. Instead what we've got borrows heavily on tropes from yesteryear for nostalgic purposes and yet uses a protagonist that few would feel nostalgic for. Videogames have come a long way since the original Bubsy, and so many of those classics have been rebooted wonderfully - think DuckTales, or Wonder Boy: The Dragon's Trap. Sadly, Busby: The Woolies Strike Back barely meets the quality standards and expectations of the genre in its infancy, let alone all these years later.